1. 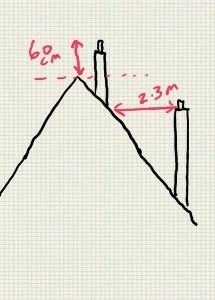 If the top of the chimney is within 600mm (60cm) of the ridge it should finish 60cm higher than the ridge. We also have the “2.3m rule”. These rules helps ensure draft is not spoiled by wind-induced turbulence. 2. Look at the top of your chimney (where the smoke comes out). Imagine an imaginary horizontal line extending 2.3m in all directions. Nothing should prevent that horizontal line extending to the full 2.3m. This rules helps ensure draft is not spoiled by wind-induced turbulence. 3. As a guide a chimney that is 4.5m high (from top of stove to top of pot) should be high enough to ensure the stove has sufficient draft. With a modern twin wall system you should get away with 3.5m or even 3m if you have to (e.g. out of a shed or caravan or boat). 4. If you have a window anywhere near then check out the regulations (ADJ diagram 17). 5. There must be no bends greater than 45 degrees and there must be no more than four bends in the chimney. If you are using four bends then you must have a soot door between the second and third bend (Building Regs). Note that a “T” off the rear of the stove is classed as two bends (2×45=90). PLEASE READ ADJ (Document J of the building regulations) PAGES 30 AND 31. READ PAGE 32 ONLY F YOU HAVE AN EASILY COMBUSTIBLE ROOF E.G. THATCHED). A chimney flue should never be less than 5″ diameter and only certain stoves can use them (DEFRA-approved stoves that allow a 5″ flue can be attached to this diameter flue). Many require a 6″ flue. Some require larger diameter flues. Manufacturer’s instructions may override this and demand a larger diameter than Building regulations ask for. If a stove requires a flue of a certain diameter you should never connect it to a chimney that has any section with a diameter less than this. To reduce the diameter of a chimney you can line it with a stainless steel “flexi” (a stove will perform best if the flue diameter of the chimney is as close as possible to that of the stove). One might also use a chimney liner because a brick or stone chimney does not pass a smoke test as required by Building Regulations. Please read CHIMNEYS AND LINERS>flexi lining first, followed by CHIMNEYS AND LINERS> concrete & composite. 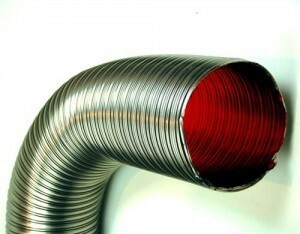 A flexible stainless steel liner should only be used within a structurally sound chimney. It should not be joined along its length (you should not join multiple pieces together to make a length). 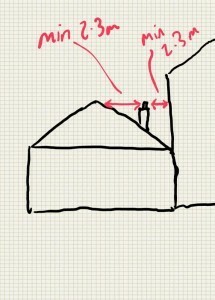 Building regs allow you to connect your stove directly to a chimney using the methods they suggest. We look at this in more detail in THE STOVE FIT DIRECT TO CHIMNEY. 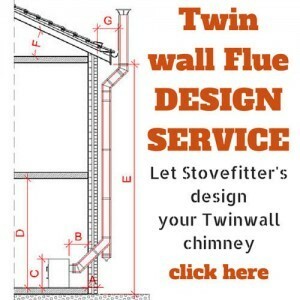 You can create your own chimney using HT flue pipe (also known as twin-wall flue pipe). See THE STOVE FIT TO FLEXI OR HT.